Mengdi Wu is the designer & founder of "Miss Locker" teen girl bag brand. First designer featured in Michelle Obama's "Better Make Room" education campaign, to inspire more kids to go to college. Mengdi's designs are featured in Seventeen, Teen Vogue, InStyle, China Daily, CBS News, Yahoo News, People’s Daily, Cosmopolitan China and more. She is also the youngest designer ever to be nominated for InStyle’s Independent Handbag Designer Awards. And she is also a United Nations speaker on topic of young entrepreneurship, education and gender equality, hope to inspire teen girls to go for their dreams. Here is her story in her own words. As a big fan of the movie Kung Fu Panda, in my subconscious I pictured myself as Po, the panda. I don’t necessarily consider myself as someone with extraordinary talent, but I have always been willing to work hard for my dreams. I am Mengdi Wu, an ordinary kid from China who came to New York City with my family at the age of 13. I knew my life would be completely different the day I set foot on American soil. My parents had hoped I’d pursue a career in finance, but I was drawn to the arts instead. They were against it at first, but after I entered several design competitions and won, I proved to them that I was serious about my work. Eventually, they let me follow my dream to become a designer. I have always looked up to Marc Jacobs, Alexander Wang, Jason Wu, Anna Sui, and Tom Ford, just like Po looked up to the Furious Five in the movie. Knowing they all went to the same fashion school, I said to myself: I need to go to that top fashion design school! My dream came true the day that I received my acceptance letter from Parsons School of Design. During my first year, also known as the “foundation year”, I was required to take a wood workshop. I would carry long wooden panels in the rain, which tested my endurance, mental capacity, and physical limits. It pushed me to the extreme, but I didn’t complain. The work made me strong enough to face all the challenges coming my way. I would stay up until 3 o’clock in the morning sending emails to magazine editors asking them to feature my work in their publications. All that hard work eventually paid off, and I started seeing my designs in Teen Vogue, InStyle, China Daily, CBS News, Yahoo News, People’s Daily, Cosmopolitan China and more. I also got support from the United States Congress, which was incredible! I won 5,000 RMB from the “Design Your Own Tote Bag” competition hosted by Coach Hong Kong. I decided to use the money towards starting my own company to design bags for teen girls. My vision for the brand was that the bags are a girl’s mini locker and that’s how “Miss Locker” was born. My goal is to inspire teen girls to go for their dreams by sharing my story and bag designs. I will continue to work hard to inspire kids to go to college and turn their dreams into reality! 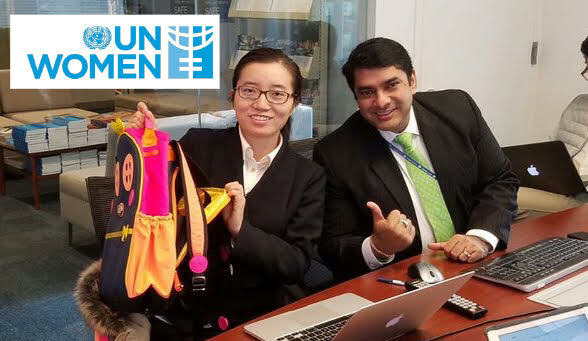 I’m continuing to work hard as a bag designer to help more girls, presented my design in UN Women and Microsoft, hope to inspire more young entrepreneurs to go for their dreams.